Does anyone know how to buy stuff to send to uk from the audi tradition website? The website doesn't seem to process payment even after I managed to register. Is there a contact number? Thanks. You can't. There have been various threads about this, it's just not working and AT are not helpful in any way. The only way now is to buy from suppliers in Germany who are prepared to buy from AT for you adding an appropriate handling/admin fee. 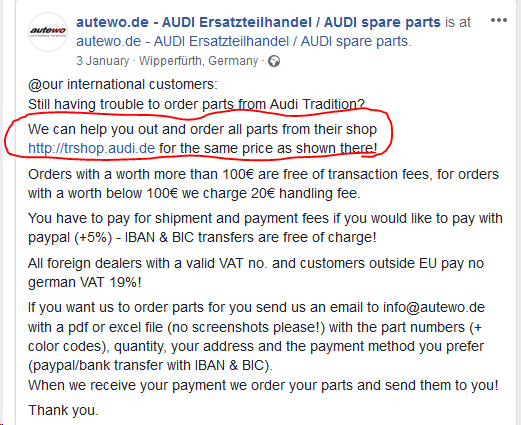 I am now buying stuffs from audi tradition through www.autewo.com, with quoted price cheaper than their web site but they will add shipment cost on top later for 2nd bill. autoewo advestised that they can help you order from tradition without extra cost. I have a vat number for my business. Bumberclarts still won’t let me in! 94 RS2 Noggy,LHD,MTM map,18"cup 1s,245/35/18,Bilsteins,RS2 H&Rs,Cup splitter. That seems unlogical if they have same parts as tradition on their website. I guess they offer to order from AT parts which they don’t offer. Lovvit! My son just asked me "Dady what's a Bumberclart"
I hope you took that the right way? I thought it was very funny,...... something you used to hear London way 20 odd years ago.